Location: Essentially on the Equator. Difficulty: Grade F, YDS class 2, snow/ice climb. 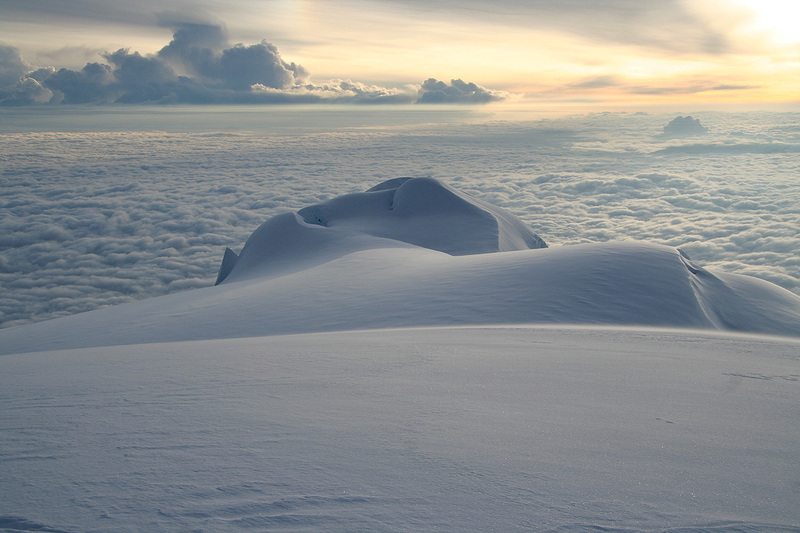 Cayambe is the third highest mountain in Ecuador. 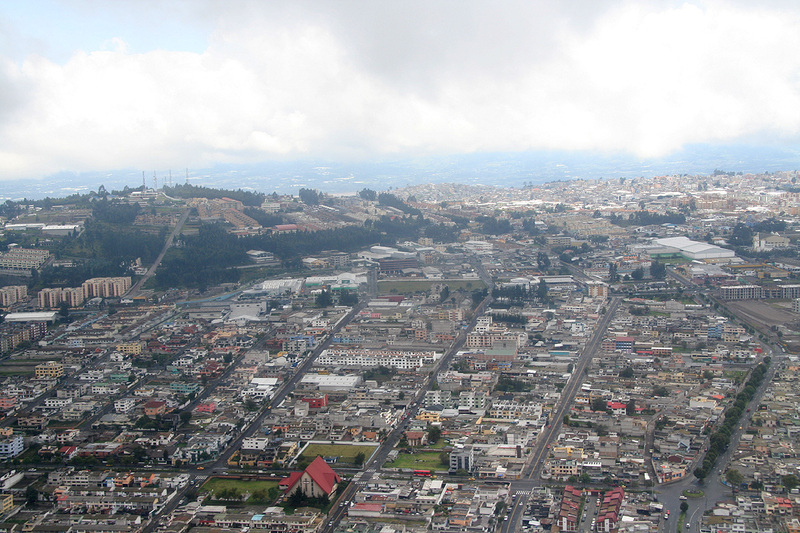 It is located north of the capital Quito. The summit is barely north of the Equator, but very close. In fact, the Equator passes through its highest point on Cayambe and Cayambe is the only place on the Equator with permanent ice and snow. 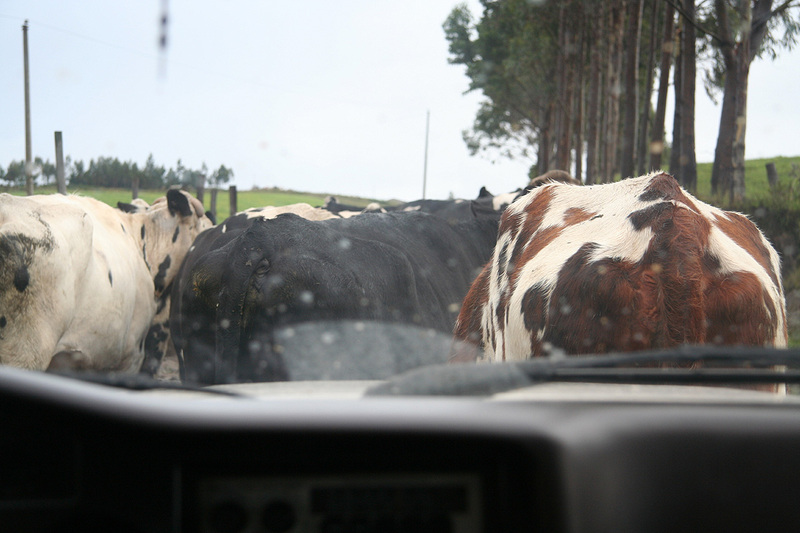 Drive north from Quito to the city of Cayambe. From here, a rather long (30 kilometer) dirt road runs all the way to the Cayambe Refugio. A 4WD is needed as this road also gets fairly rough, in particular towards the end. One can park right next to the hut, location N00:00.511, W078:00.582, elevation about 4630 meter. Note that the hut itself is only about 900 meter from the Equator. The route climbs the mountain that comes directly down to the hut. Follow a pretty clear trail (several variants in the beginning), gravel and easy scree with some easy scrambling. This trail immediately heads uphill. Familiarize yourself with this first section the day before your climb if climbing without a local as you will need to find the correct way in the dark. 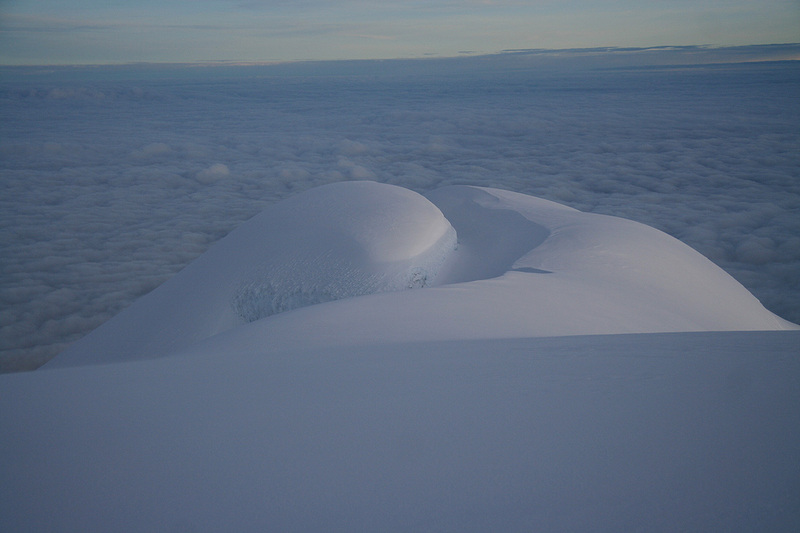 The route climbs this broad, rock ridge essentially to its pretty flat top, traverses and descends slightly in order to access the Cayambe glacier in a very nice and easy location. This may take about one hour, the location is N00:00.913, W078:00.342 with an elevation of about 4880 meter. 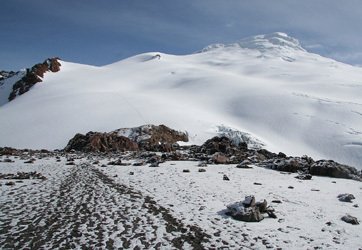 This picture, taken high up on the glacier, shows the initial broad rock ridge, one can also see the Cayambe Refugio on the ridge below (left) of the rock ridge. From here, ascend the glacier along a pretty gentle slope in the direction of a small, local ridge with a small rock spur. Contour on its right side and continue uphill to gain a broad (glacier) shoulder. 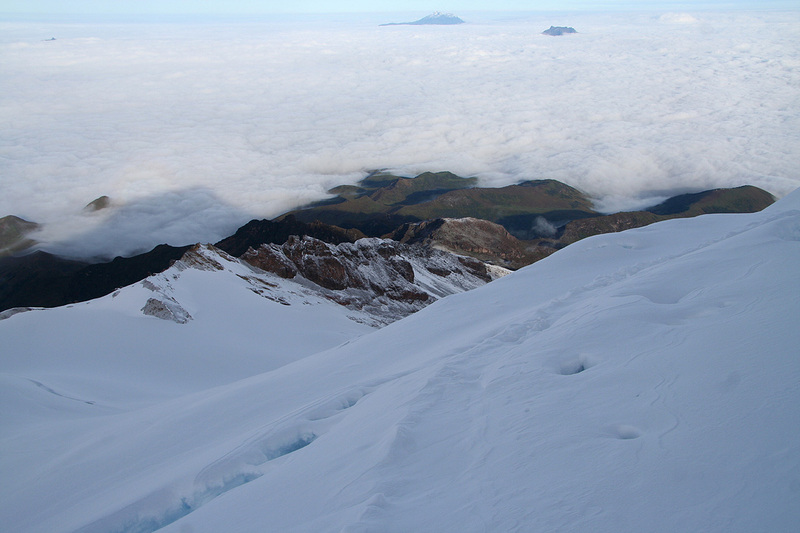 From here, you see the steeper part of Cayambe straight ahead. 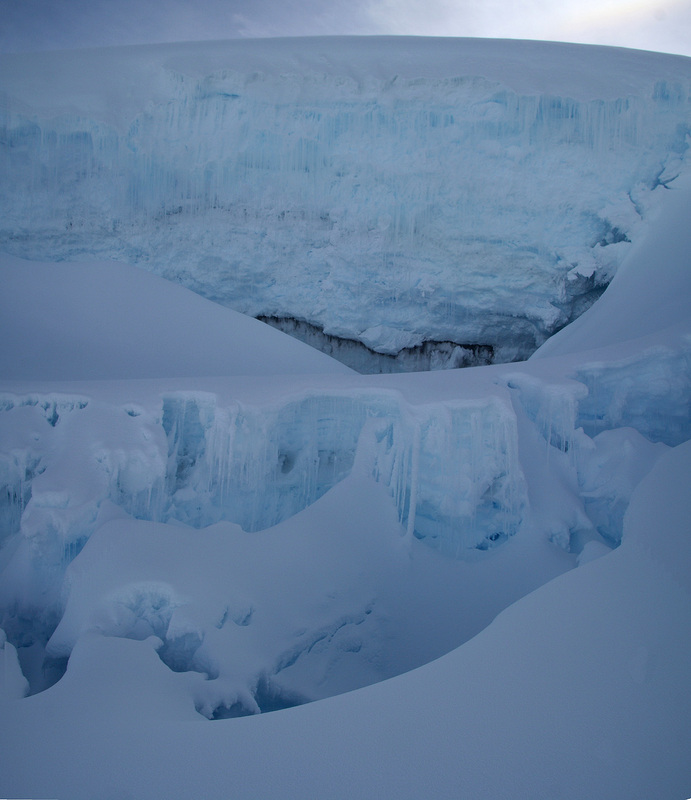 It is obvious that a significant icefall higher up may pose route finding problems. Climb directly up the middle of the slope and find the most natural way between a couple of large seracs. In a season with sufficient snow (as we had), one can then find a good line that heads more right (as seen when facing uphill). Make a couple of large curves, following the best line uphill, and complete this ascent by a somewhat steeper line going right and gaining the top ridge above. 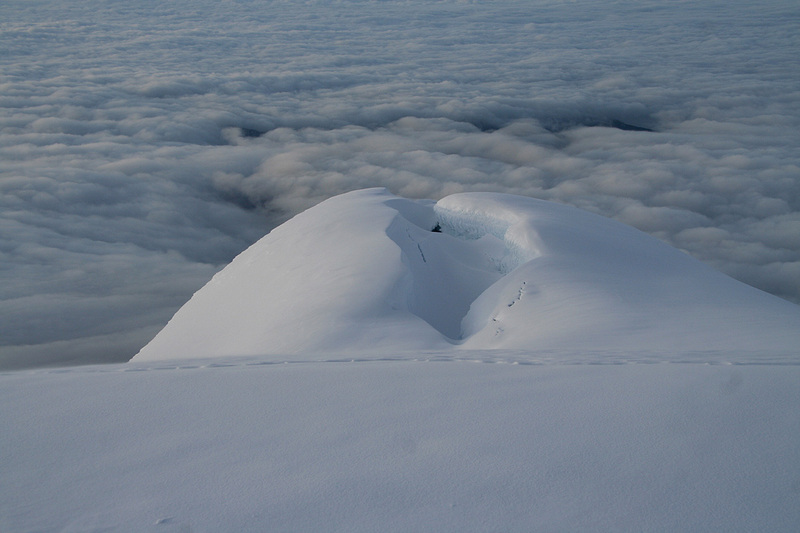 Cross a short, more level area, then climb the snowdome that is the highest point on Cayambe. 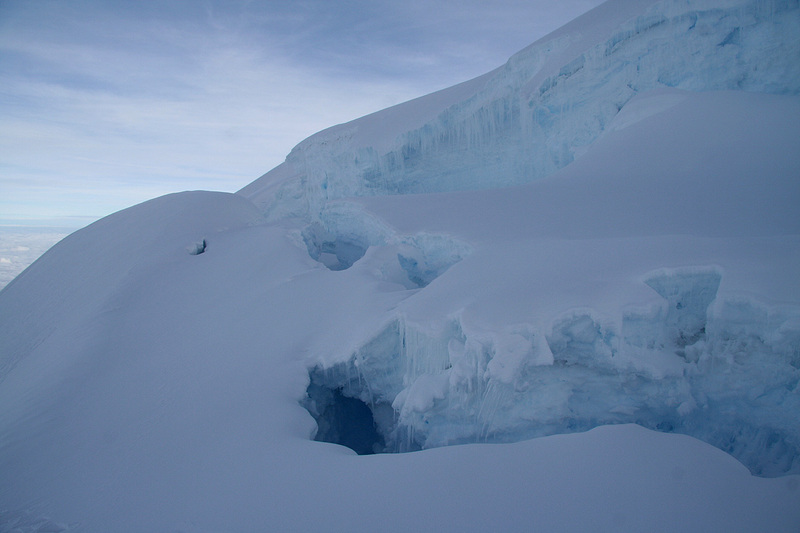 Note that the grade (difficulty) can be substantially harder if the crevasse near the top becomes hard to cross. Return to the Ecuador summary page. The beginning of this trip report is here. 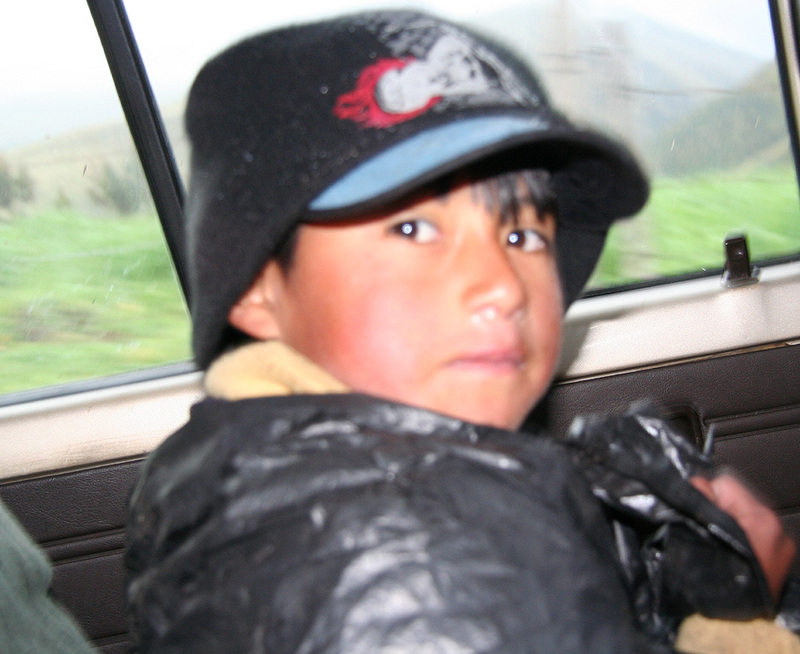 Day 11:We travel to the Cayambe hut. Slow and easy morning. After breakfast, we took an excursion on foot to the National Mapping Agency. We were being helped by a very competent man there. He pulled out the maps we asked about, all in scale 1:25.000. He quickly located our mountain Loma Santa Cruz Chica and we could easily determine its elevation and prominence etc. Only when the converstaion turned to the height of Chimborazo, a problem surfaced. It was clear from his behavior that this was a somewhat sensitive issue. He went to the back office and "hauled out" a bigger boss (jacket and tie), to have him answer. He delivered the official lie: "the elevation was 6310 meter, if our GPS units indicated something different, we should know that GPS units were known to be at least 50 meter wrong in this location." Diego picked us up around 1500 as agreed the day before. This gave us maximum restitution in Quito. 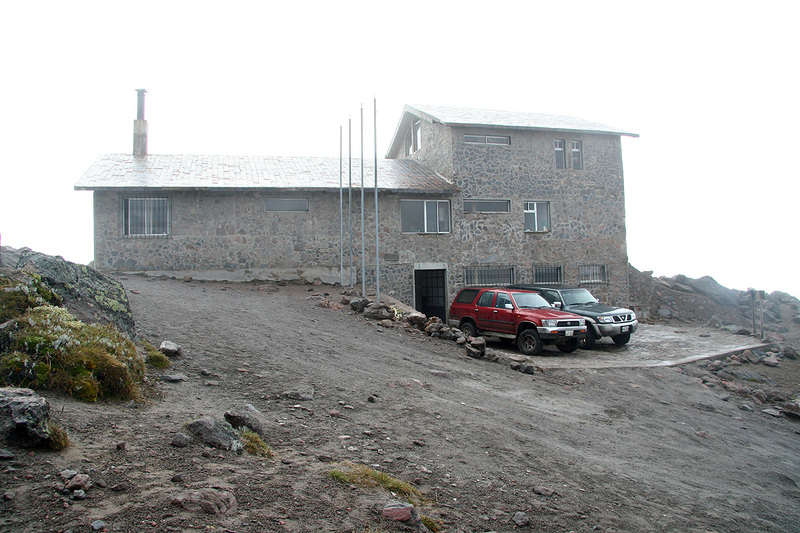 The plan was to drive up to the Cayambe Refugio, have dinner then sleep until midnight and depart around 0100. Being fully acclimatized, we felt confident that a "blitz" approach would be fully adequate. The drive was nice and easy. The lower part of the road to the refugio was subject to local road work. This had left it in a state of endless mud all on the edge of a very large drop to our right hand side. The landcruiser made it across, but not without some slippery slides and critical moments. Higher up we ran into a herd of cows, they refused to move out of the way and we needed to send Rob out. The cows had never seen anything like him before and moved out of the way. A bit later, we saw a young man with his small boy walking uphill. Diego knew the man and we offered them a ride. The young boy was wrapped in a black (garbage) plastic bag, obviously his rain gear. He smiled and appreciated getting a ride instead of having to walk home. We arrived around 1800 as planned. There were two commercial groups at the hut. 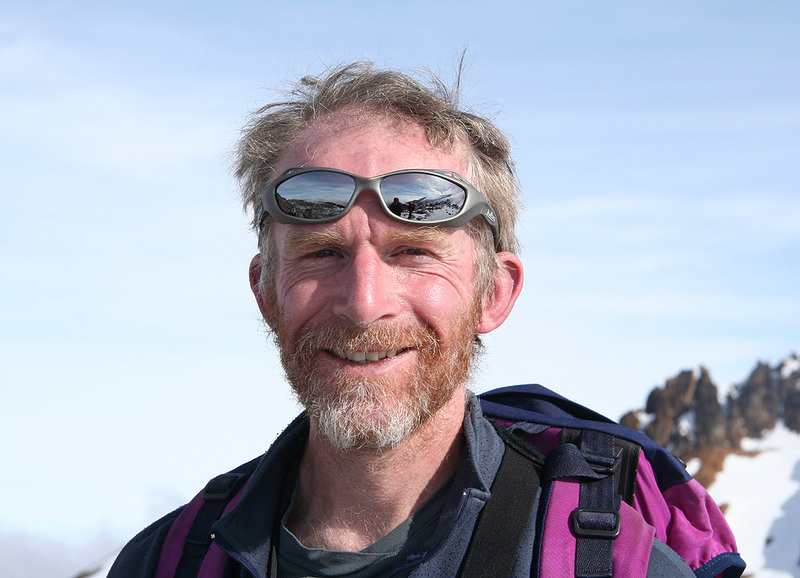 One from Mountain Madness, the other from Adventure Consultants, the two pioneering companies that played a prominent role in the well known book "Into Thin Air" by Jon Krakauer, a critical review of commercial guiding practice in the high mountains. We got up at midnight according to plan and had a good breakfast. 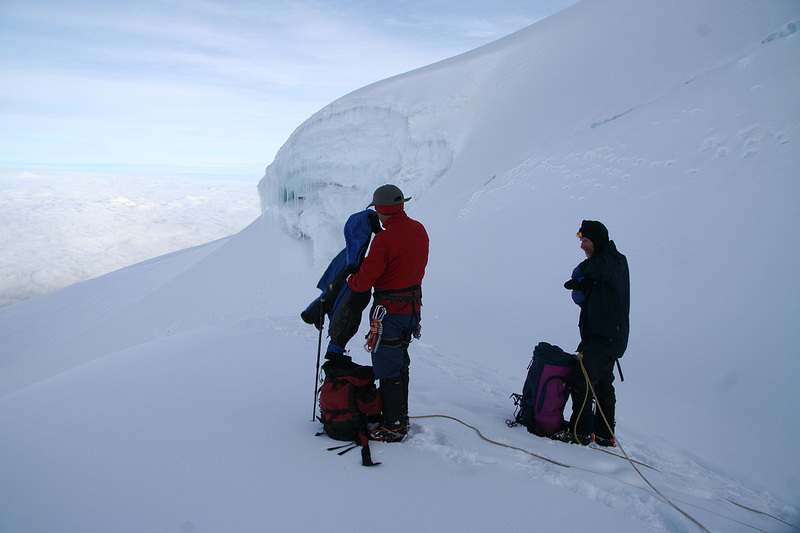 We were the only team to climb, the other two groups should stay two nights for acclimatization, then descend to Cayambe (village) for one night before trying to climb Cayambe several days from now. We made good progress up the initial trail and across the huge mountain ridge. 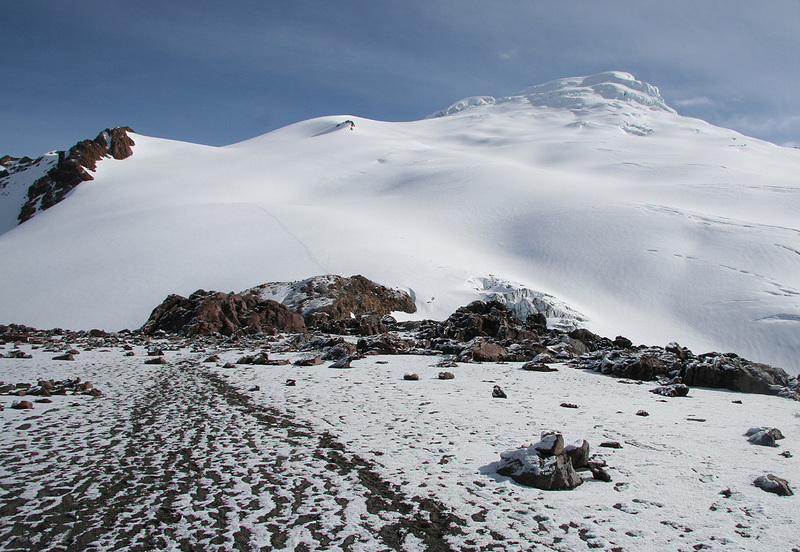 We arrived at the Cayambe glacier after one hour. 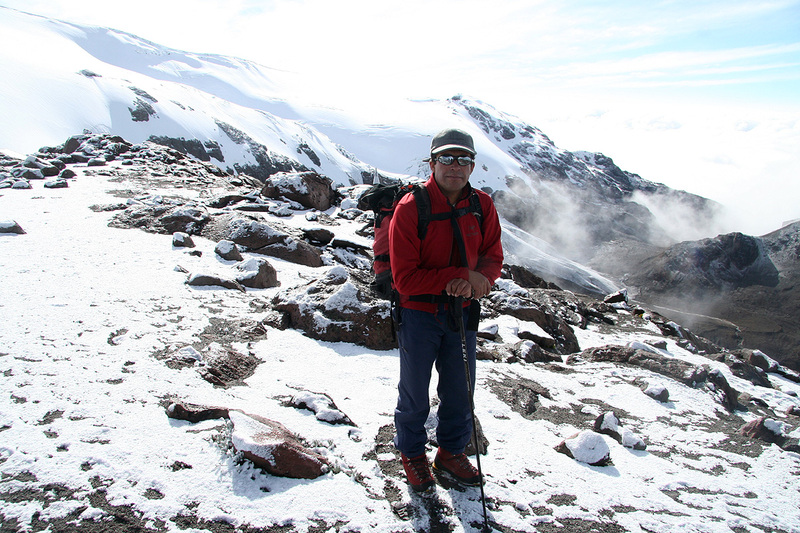 The snow was much better than on Chimborazo and the slope less steep. This was really a very easy climb. We stayed together and advanced to the main ridge before the steeper part of the hillside. I could see the seracs higher up and realized that finding a good route higher up certainly would depend on the snow conditions. Right now, conditions were close to ideal and it was pretty obvious how to pick a good line. The last traverse going right seemed steep, but was easier than it looked. 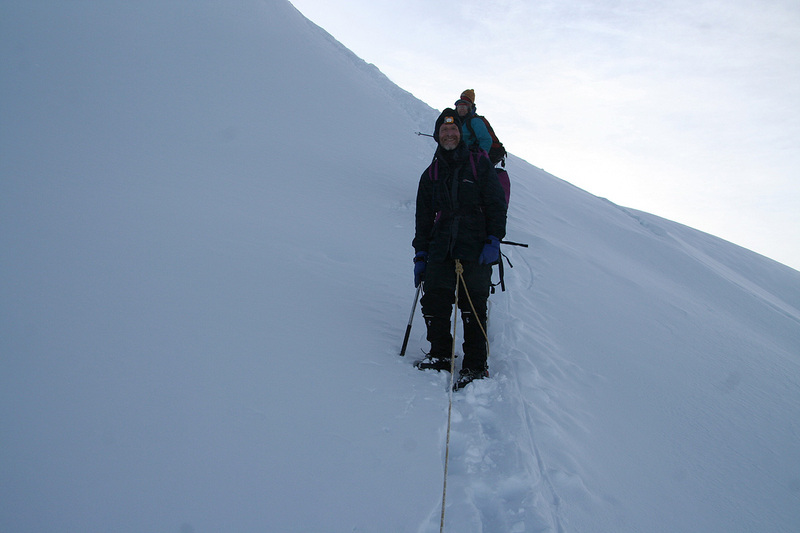 A few, last careful steps across the ridge with a very minor crevasse, then more gentle terrain. We could see the final snow dome a short distance ahead, a short, final hill and we were there! 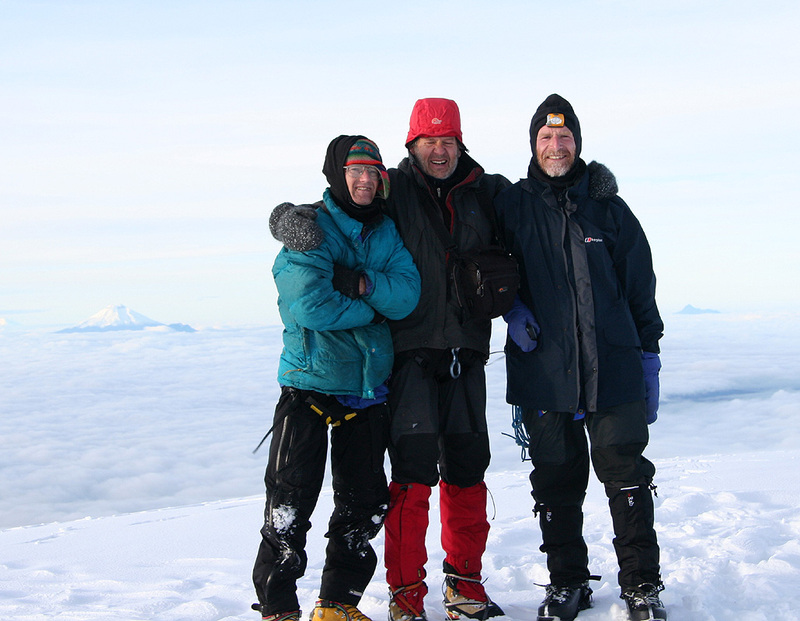 The time was 0620 and here we stood on our last and final summit, the third highest in Ecuador. What a very special place to end this trip to Ecuador. Only one team climbing - ours. Clouds extending in all directions, Rob walking around, Adam resting. We had calm weather, with good visibility. The land was covered by clouds, but the major peaks were all visible. First, a nice view across to nearby Imbabura and Cotacachi. 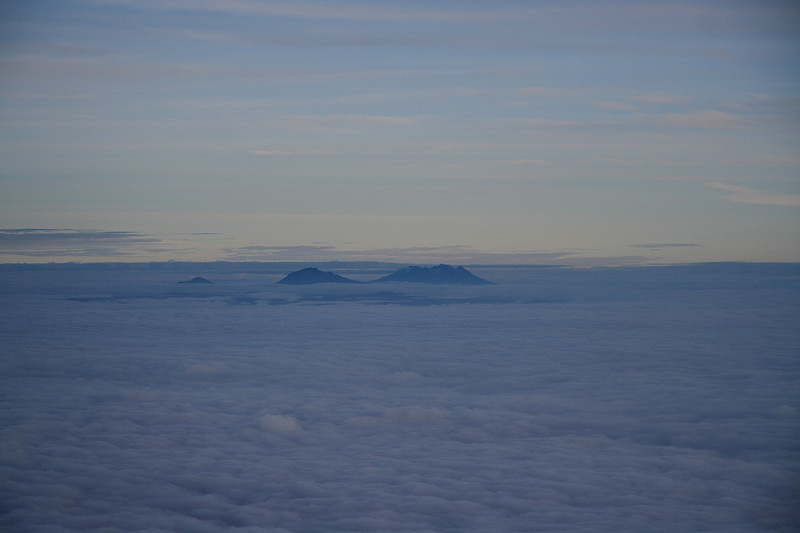 Like ships on a sea of clouds, quite a nice view and quite nice memories from two very nice climbs. 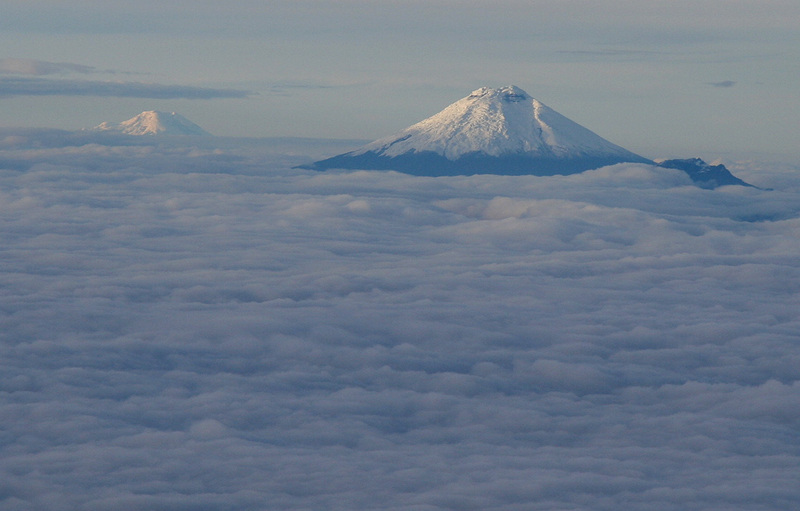 Looking more south, we could see all the giants, Antisana, Chimborazo and Cotopaxi. Across, in the direction of Quito, the bulky Pichincha, our second summit on the trip. 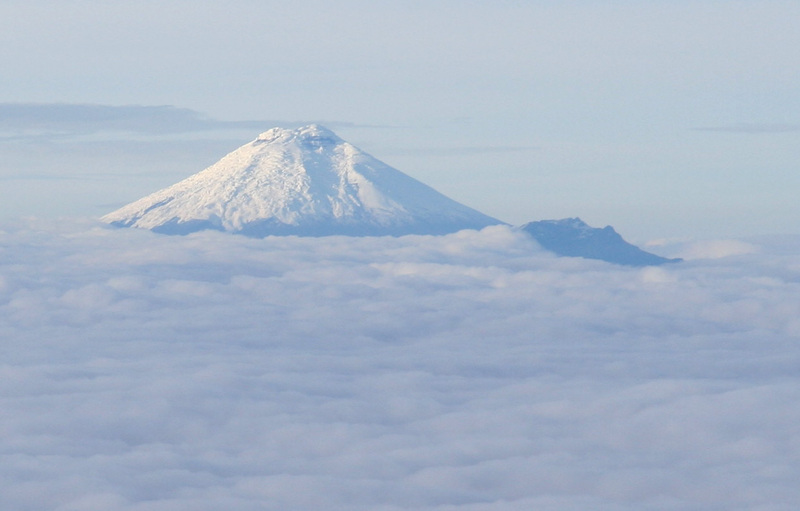 Pasochoa could not be seen, too low to rise above the clouds. Interesting snow formations extending south from the summit. Somewhere down there (about 2.7 kilometer) is the Equator. 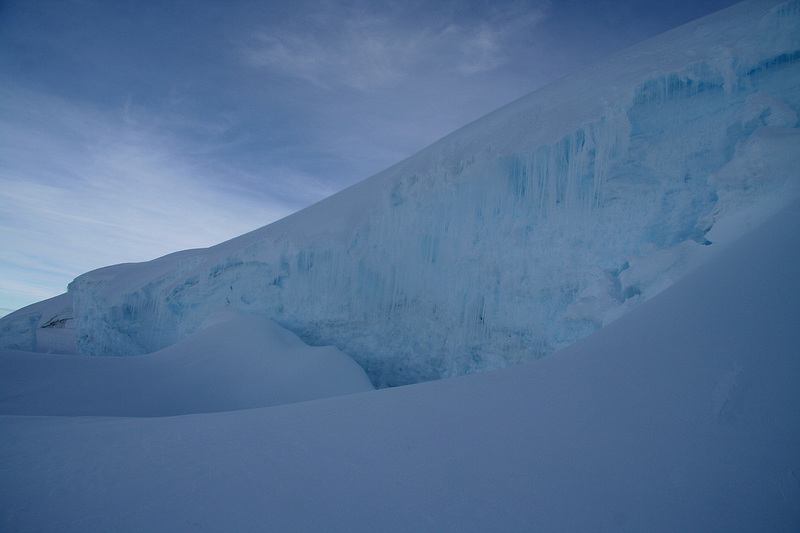 The snow forms the landscape at the higher elevations, further down this mountain has pretty big icefalls with numerous crevasses. All good things must end and around 0650 it was time to start descending. Facinating ice landscape in the upper part, we made several short stops to capture some of it by camera. We were descending and the clouds were ascending, interesting light and views. Imbabura was about to be swallowed by the clouds. We walked quickly downhill on good snow and pretty soon, we were off the glacier. Time for a major stop. Nice and warm, it was time to pack away crampons, jackets etc. A small lake was on our right side, just in the transition area between rock and ice. Rob certainly looked quite happy with another successful day. 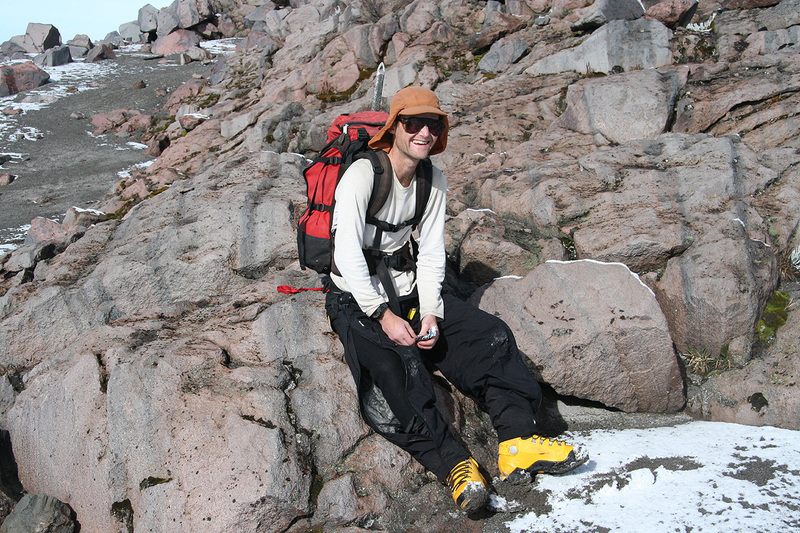 Adam was also happy, despite missing Chimborazo, he just realized that he had climbed an earth octant highpoint. Diego had been our local guide and driver the last two weeks, his next assignment would begin already on Sunday. 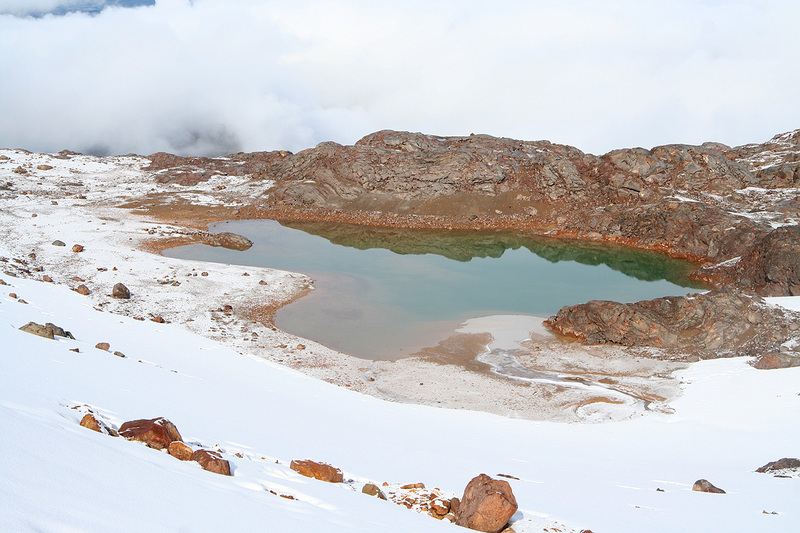 Cayambe was still brilliant in the sunshine, while the clouds were rising above the refugio. As we continued downhill, we walked into the clouds and only memories reminded us of how different the world higher up indeed was. We arrived back at the refugio by 0845. 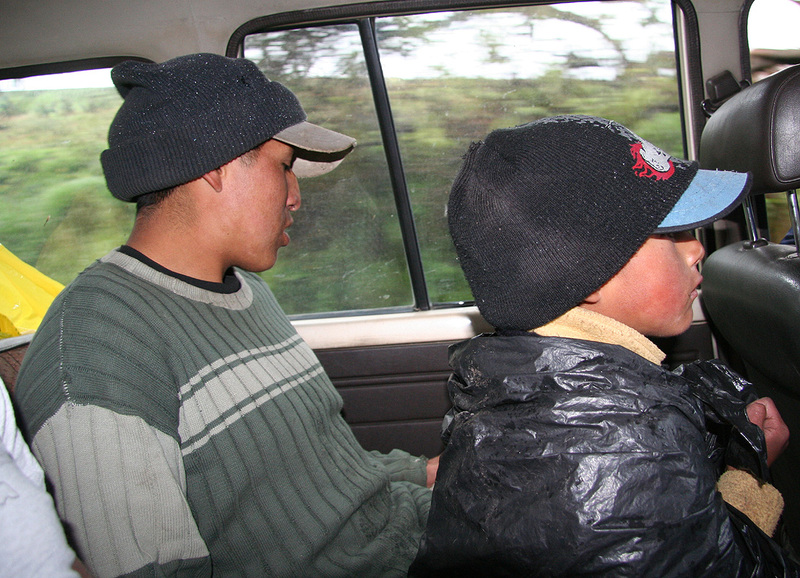 Shortly thereafter, we were on our way down the bumpy road and then back to Quito. When you start the day at midnight, quite a bit can be accomplished even before noon. Day 13:Wrapping up and going home. Back at Casa Helbling, we had a spare day before flying home on Sunday morning. The day was used to organize gear and to do a little Chrismas shopping. We had a good dinner celebrating our trip in the evening before making the last adjustments to the baggage. Rob and I would have a 0700 pickup the next morning, while Adam had a late afternoon flight. 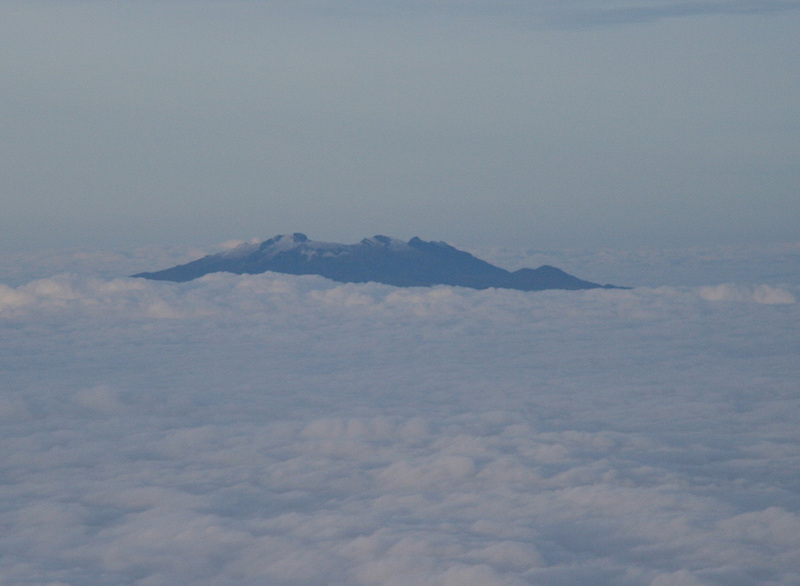 The flight was on time, Quito disappeared below me and soon I was back for a short stop in the Antilles. 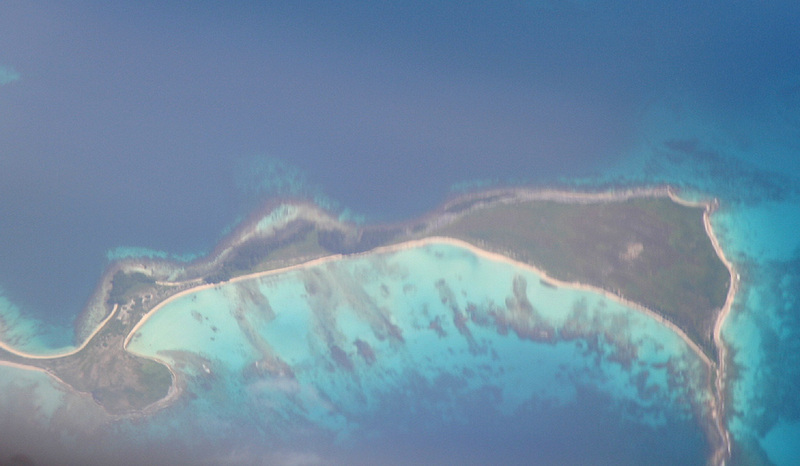 A few more Caribbean coral islands then across back to Europe. Many thanks to Rob and Adam for good company and help making this trip a great success. Also, again thanks to Diego for his good advice and indepth knowledge which helped us succeed on all our objectives. 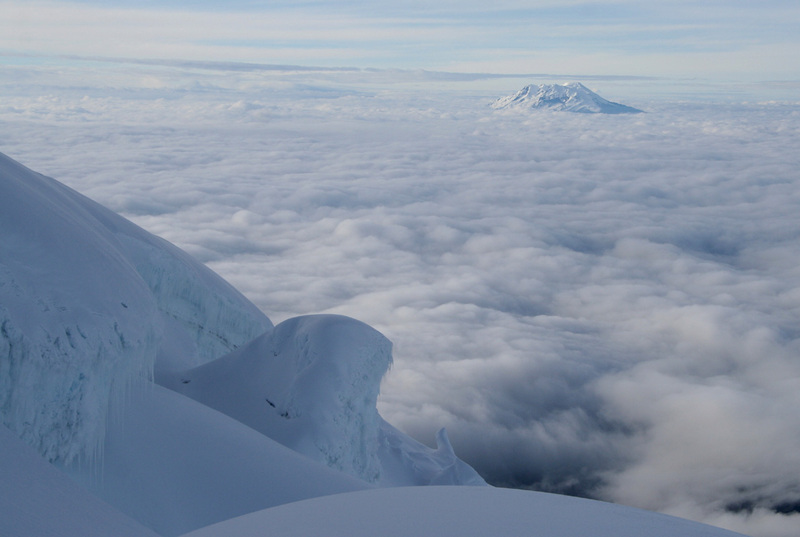 Cayambe as seen from the intial mountain ridge. 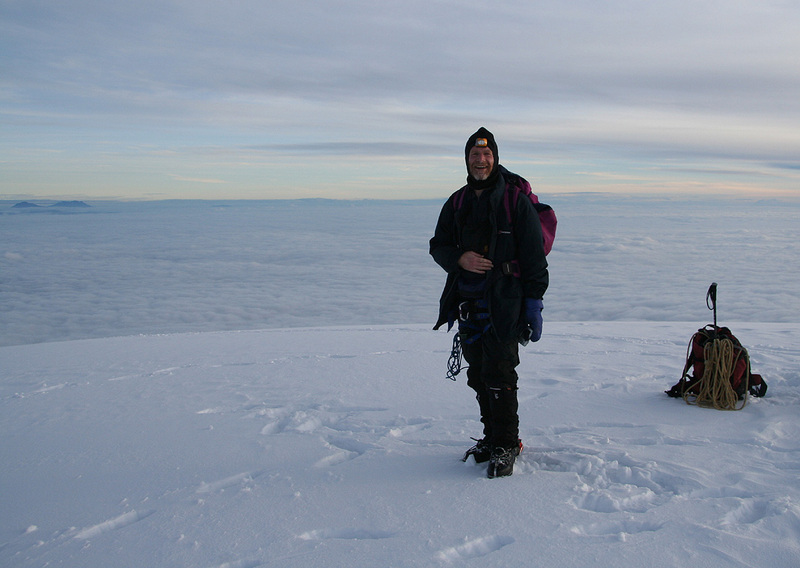 Robert Woodall on the summit of Cayambe. 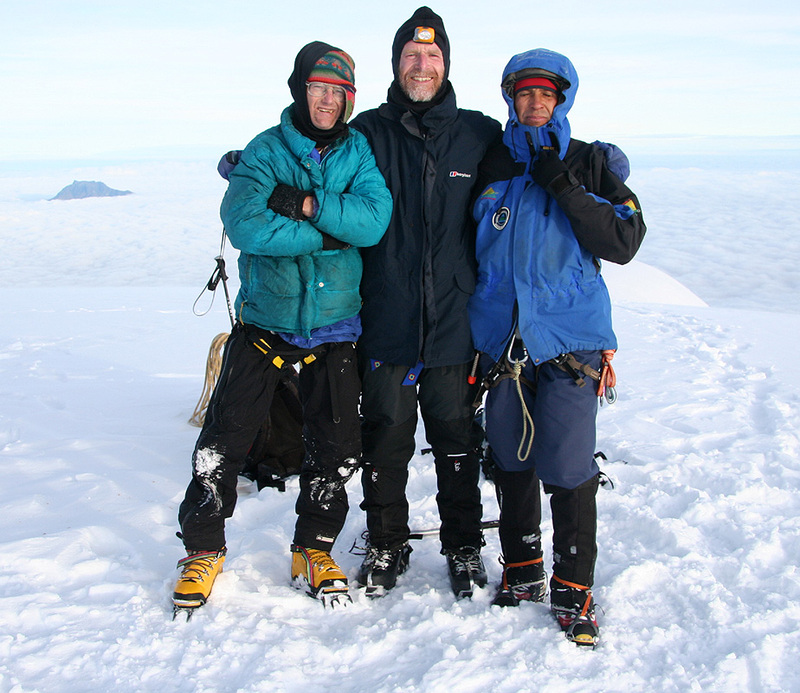 Adam, Rob and Diego on the summit of Cayambe. 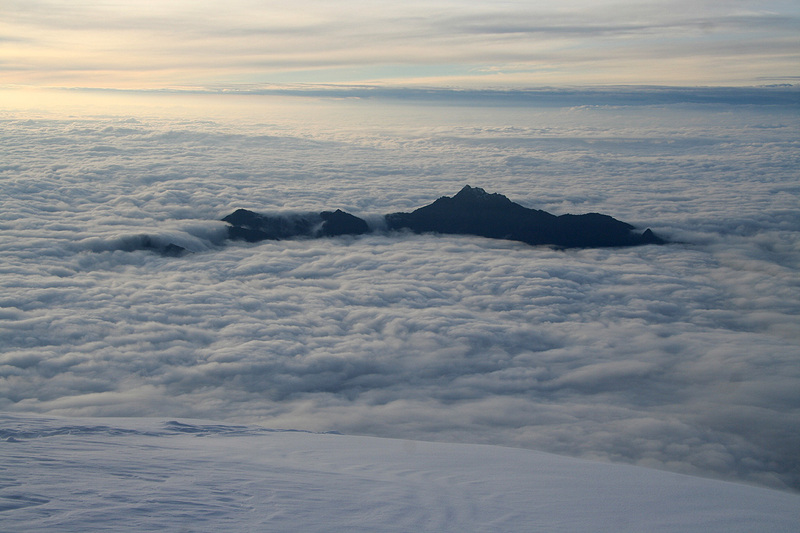 Antisana, as seen from the summit of Cayambe. 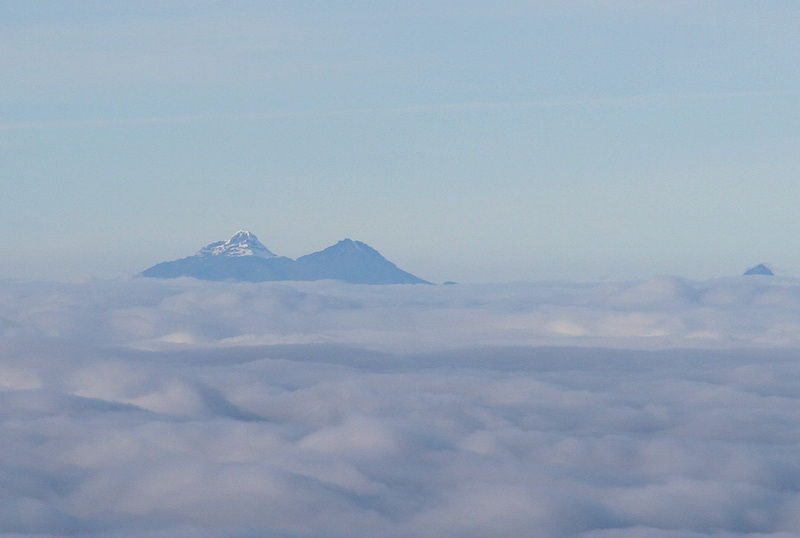 Chimborazo (left) and Cotopaxi, as seen from the summit of Cayambe. 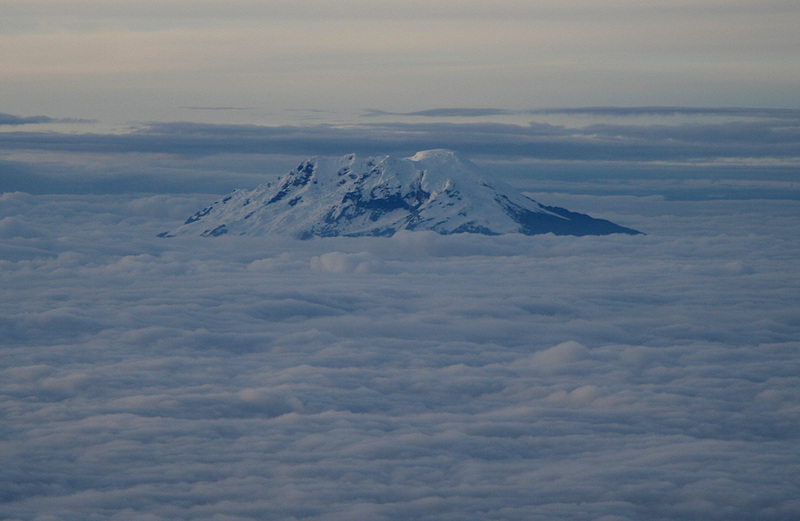 Cotopaxi, as seen from Cayambe. 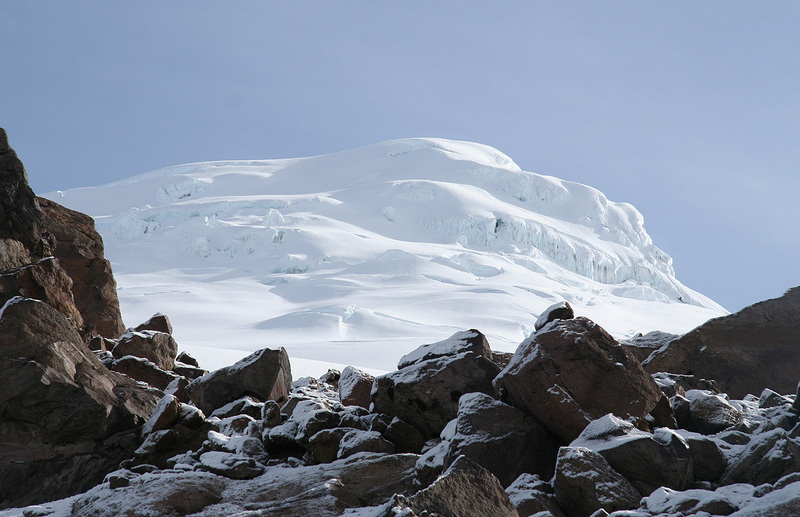 Illiniza, as seen from Cayambe. 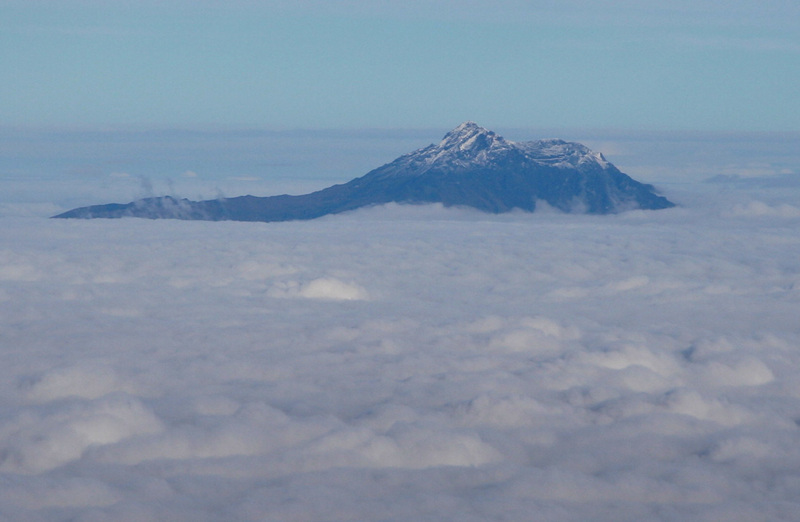 Cotacachi, as seen from Cayambe. 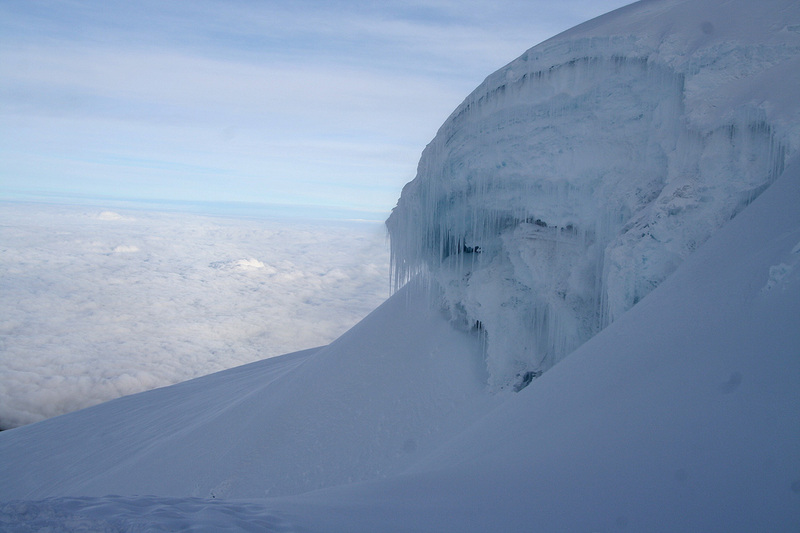 Cayambe with icefall. From the top to the base. 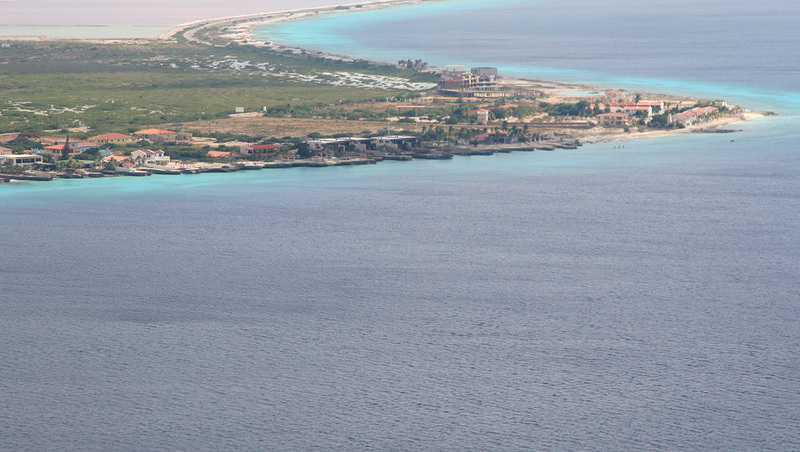 Summit Panorama view. 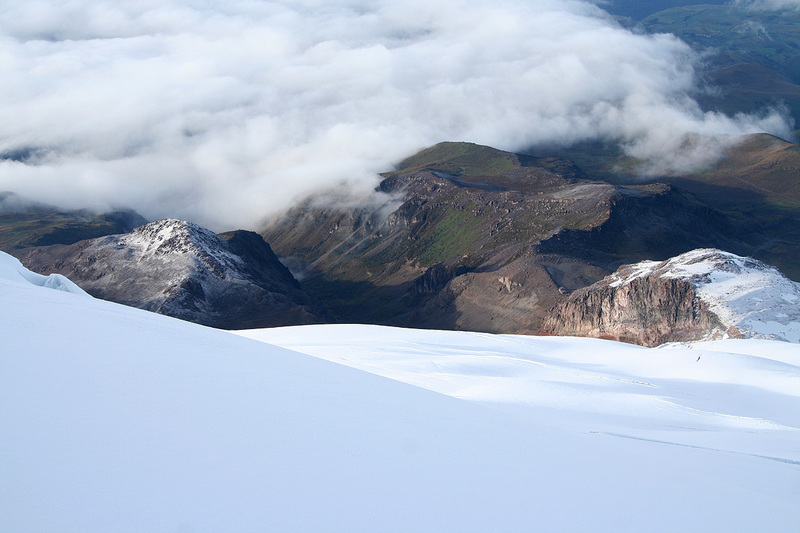 Antisana, Chimborazo, Cotopaxi and Illiniza. They will organize and provide exactly the kind of service/support that you request. Our guide, Diego Zurita, was first class. It is quite possible that the other guides from this company hold similar qualities. This is a perfectly reasonable and nice place. Many other mountain guests, a good library with books about the mountains in Ecuador etc. Reasonable rates for the room. They provide storage for excess luggage if you are away a few days etc. The front desk has knowledge of English and German. Grand total, US 2850.- or about NOK 20.000. The airfare can possibly be reduced by making more research and or adjustments of travel dates. We did not attempt to make this a very low budget trip. 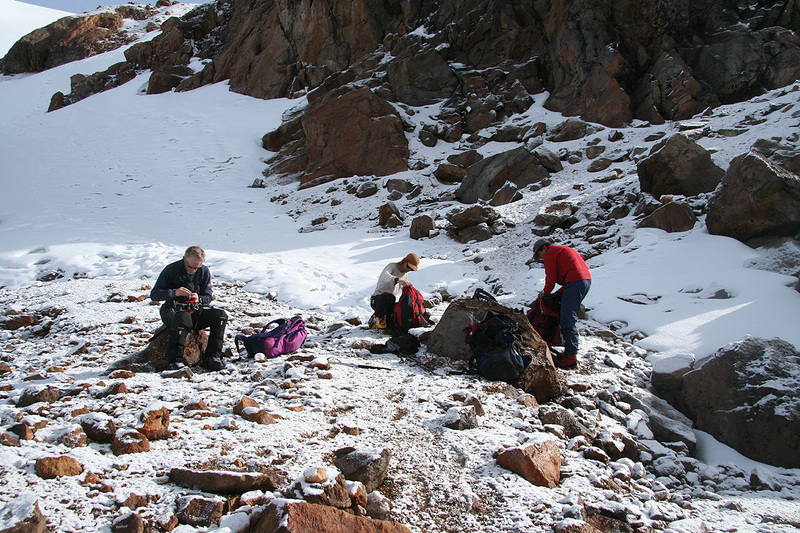 There is a standard charge of about US 20.- per person and night at the (high) mountain refugios. charges between US 3500.- and US 4000.- for the three highest summits in Ecuador and this does not include travel cost. 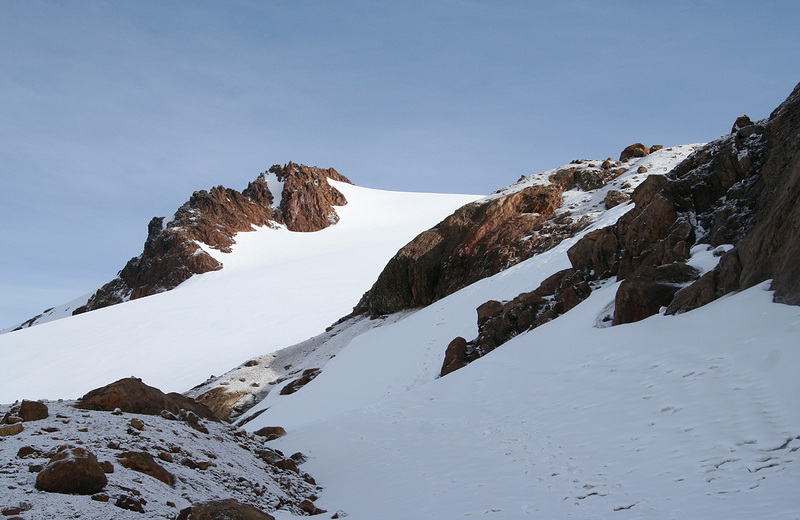 The acclimatization is different from many large mountains where one typically move from one camp to the next (up the mountain.) In Ecuador, one can stay at comfortable hotels and lodges, typically at elevation from 2800 meter to 3700 meter and then climb the big peaks with a single (half) day stay at the high mountain huts (refugios). In order for this to work, one should plan a schedule with climbs of several mountains in the 4500 meter range before attempting the high peaks. See our trip report as an example. Obviously,one may also decide to stay several nights at the high huts if that should be desired. Some medical data on oxygen saturation and heart rate was collected during this trip. Return to Petter's Mountain page.